Data Communications and Networking 5 Edition Data Communications and Networking is designed to help students understand the basics of data communications and networking, and the protocols used in the Internet in particular by using the protocol layering of the Internet and TCP/IP protocol suite. Technologies related to data communication and networking may be the fastest growing in today's culture. The appearance of some new social networking applications is a testimony to this claim. In this Internet-oriented society, specialists need to be trained to run and manage the Internet, part of the Internet, or an organization's network that is connected to the Internet. 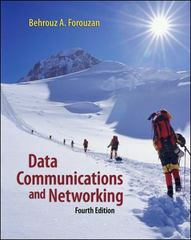 As both the number and types of students are increasing, it is essential to have a textbook that provides coverage of the latest advances, while presenting the material in a way that is accessible to students with little or no background in the field.Using a bottom-up approach, Data Communications and Networking presents this highly technical subject matter without relying on complex formulas by using a strong pedagogical approach supported by more than 830 figures.Now in its Fifth Edition, this textbook brings the beginning student right to the forefront of the latest advances in the field, while presenting the fundamentals in a clear, straightforward manner. Students will find better coverage, improved figures and better explanations on cutting-edge material. The "bottom-up" approach allows instructors to cover the material in one course, rather than having separate courses on data communications and networking.